Vantec recently announced NexStar, a wireless docking station for your additional hard disk drive. If you want to easily extend the storage capacities of your computer, iOS and Android devices at home, the WiFi HDD docking station should be a nice solution. 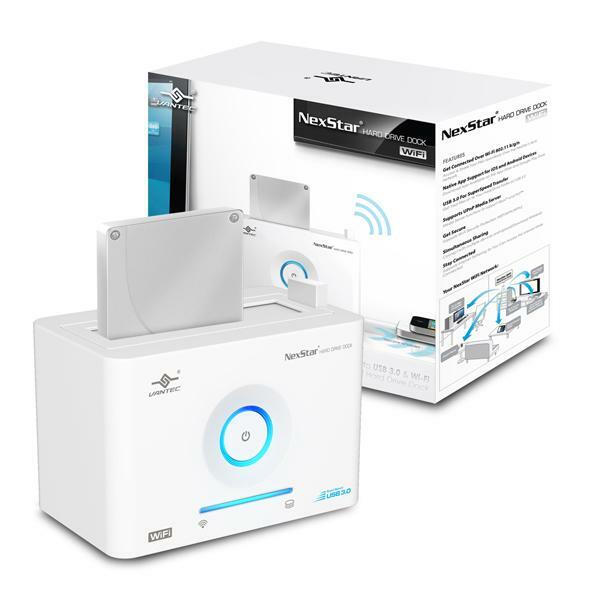 The NexStar is a versatile wireless HDD docking station that measures 136 x 83 x 87mm. As we can see from the images, the hard disk dock features sleek modern design with white coating, and unlike most of traditional HDD docks, NexStar docking station allows you to connect it with your iPhone, iPad, Android device, computer or UPnP ready Smart TV via WiFi network in order that you can wirelessly enjoy various contents from your hard disk on the dock via your mobile devices, computer or Smart TV. Moreover, the wireless dock also comes with a USB 3.0 interface for high speed transmission, and it supports both 3.5″ and 2.5″ hard disk drives. After the break, check out the following demo video. The NexStar WiFi HDD docking station will be available soon, but the price hasn’t been unveiled until now. If you’re interested, jump to Vantec Thermal Technologies for more details.